On the way home from his guy's weekend in California, Ed and his buddies stopped at the Quartzsite Yacht Club for a quick bite before finishing out the trip. A "yacht club" in the middle of a hot, dry desert with less than four inches of rain per year is a bit unusual. Then again, Quartzsite, Arizona itself is a bit unusual - known for its rocks, RVs, and United States Camel Corps. But it exsits. While there, the four guys decided to apply for memberships to the yacht club. 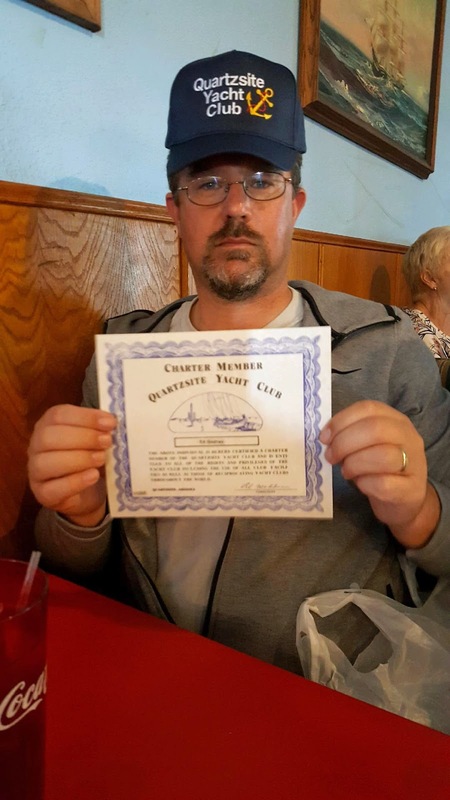 The club boasts having the largest membership in the world, and for the membership fee of $49.99 not only do you get a hat, t-shirt, membership card, and certificate ready for framing, but you actually get to utilize their membership at other yacht clubs around the country. Apparently, "a good majority of Yacht Clubs around the country offer reciprocal memberships, which means that those belonging to another club can present their card and gain access without a fee." Now, all we need is a yacht.